Please click in the select column to choose your course, then fill out the required information and click "proceed with registration". You will be directed to the Smarten Up Institute website to complete payment information. Use discount codes CETFAINTRO (Introduction to ETFs) or CETFAADV (Advanced ETFs) for the on-line courses. This email address is already registered in the system. Please, provide your first name. No extra information is required. Please, confirm your selection of a new course and click proceed with registration. Enter a valid e-mail address. All e-mails from the system will be sent to this address. 4 IIROC Professional Development Credits. Canadian investors have approximately $95 billion invested in more than 400 Canadian-listed ETFs. As ETFs gain in popularity as an alternative to other traditional collective investment vehicles they will start to be a greater focus by the regulators and the investment professionals need to be prepared. 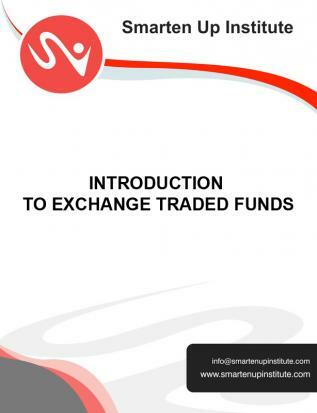 The objective of this course is to provide the financial services professional with an overview of Exchange Traded Funds. Canadian investors have approximately $95 billion invested in more than 400 Canadian-listed ETFs. As ETFs gain in popularity as an alternative to other traditional collective investment vehicles they will start to be a greater focus of the regulators and the investment professionals need to be prepared. This 1 day classroom course provides the financial services professional with an advanced overview of the Exchange Traded Funds market. Learn the history, characteristics, how ETFs are created and the benefits of investing in ETFs. We’ll look at how they compare to other pooled funds, strategies and evaluation methods employed. In this two (2) day session, you will investigate the history of the most traded instrument at present: ETFs or Exchange Traded Funds. ETFs were created in Canada and the first one traded on the TSX in 1989. There are a myriad of ETFs available and there is widespread misinformation and misconceptions associated with this product. In this two day course we'll review ETF structure, characteristics and creation process, the indexes on which the ETFs are based, ETF strategies, and the myths of ETF investing. ETFs are being created every day and are attractive to investors due to their ability to be as diverse as a Mutual Fund. However, they act like a stock and can be used by investors and institutions as a method of portfolio hedging. This course will compare ETFs to other products and review tax favorability that has provided momentum in the product's growth. All course materials are provided. Upon confirmation of registration, the student will receive a free one-year subscription to Investment Executive, Canada's Newspaper for Financial Advisors.